Insects form a natural food source for many aquatic animals. 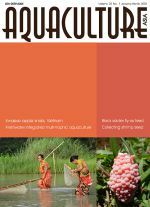 This and the presence of chitinase makes insect meals a logical alternative to fish meal in the formulation of aquaculture diets. Insect meals have also been shown to allow for enriching through dietary intake, possibly for enrichment of polyunsaturated fatty acid levels. Of particular interest has been the use of black soldier fly larvae in fish diets. The fly is native to the tropical, sub-tropical and warm temperate zones of America, but during World War II they spread into Europe, Asia, including India, and even to Australia. It is now widespread in tropical and warmer temperate regions of the world. 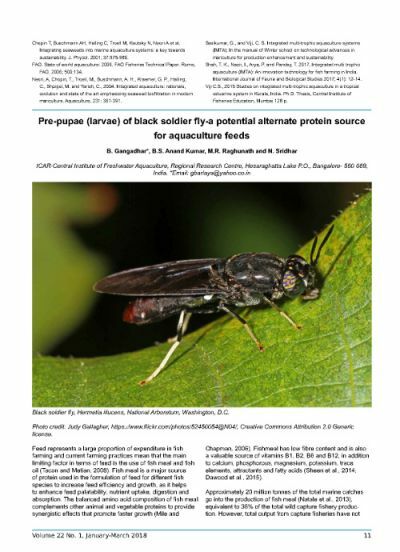 This article reviews the life history and potential of black soldier fly larval meal to replace fishmeal used in fish diets.